Korea has been credited with establishing “green growth” as an international goal. Former President Lee Myung-bak touted it as the next big thing, harmonizing environmental protection and economic development. 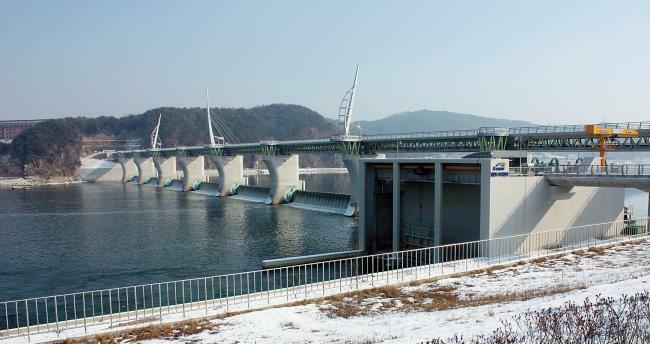 A slew of projects, including a river restoration, were pushed in its name and Korea carved its place in the international community by bridging rich and poor countries whose priorities clashed. Like many of his policies, however, “green growth” is now at risk of sinking into obscurity, as the new government conducts a comprehensive policy review. President Park Geun-hye and her officials are openly skeptical toward Lee’s green packages, saying they were too oriented toward economic growth. They hinted at a shift back to the goal of sustainable development, which Lee had ditched as outdated. Government agencies are investigating the controversial river project over not only its negative impact on water quality but also unsavory ties between the government and contractors. Even the post of ambassador for green growth has been abolished, stoking concerns of a reduced role for Korea in global environmental activities. The Environment Ministry deleted “green” from the names of three bureaus and divisions this week. Other ministries in charge of finance, industry and territorial policies have also downsized and renamed relevant offices. Park’s new environmental minister, Yoon Seong-kyu is an advocate of the sustainable development agenda. “The indicators that were used to represent the direction of green growth actually involved many of those less relevant to it including the proportion of nuclear power,” Yoon said during his confirmation hearing last month. An official of the ministry has said that green growth is only one of various policy options for sustainable development. Yoon was Park’s chief environmental advisor during the presidential campaign last year. “It is far from sustainable development so that it should be straightened out,” he said at a policy debate in October. But environment specialists and activists are raising concern that the new government’s environmental policy direction is still vague as the administration is preoccupied with the economy and welfare. Its 140-item national agenda introduced late last month has been criticized for dealing with environment issues only at a basic level, disappointing environmental groups and experts who looked to a comprehensive framework and action plans. Critics also noted that some of Park’s longtime aides and powerful advisors are growth advocates against an envisioned national carbon trading scheme and other future-oriented environmental measures. Leading the pack is Choi Kyung-hwan, a Saenuri Party lawmaker and former Knowledge Economy minister who was one of the most hawkish opponents to cap and trade. As economic minister, he said the industry may lose its competitive edge in exports and spark the exodus of manufacturing bases. “The new government has not yet shown any clear environmental policy, so I don’t see any difference with the previous one. It should examine its predecessor’s policy and move it forward through ecological development,” said Cho Myung-rae, an urban planning professor at Dankook University and cohead of civic group Environmental Justice, at a recent forum. At stake is the country’s goal of curbing the nation’s greenhouse gas emissions by 30 percent from projected levels by 2020, which was unveiled by Lee at a 2007 U.N. climate conference in Copenhagen. To that aim, the government implemented the Target Management Scheme, requiring 470 companies and institutions to set their emissions reduction goals and pay fines of up to 10 million won ($9,000) if they fail to meet them. The program is a prelude for an emissions trading system scheduled for 2015 under which firms will only be able to emit more than allotted by buying credits from those that discharged less than their quotas. Yet the ambitious 2010 goal appears far-fetched. The country’s greenhouse gases shot up a whopping 9.8 percent in 2010 to 669 million tons from a year ago, Environment Ministry data shows. The highest yearly growth since 1993 was chiefly ascribed to a surge in power demand during that year’s unusually long heat and cold waves, as well as an increase in car and steel production, the ministry said. Alarmed over constantly rising emissions, Park has requested Yoon to sketch out a fresh road map to reach the target and refine the existing cap-and-fine and upcoming cap-and-trade systems. His remarks immediately became subject to debate in line with the European Union’s recent move to modify their binding limits by taking the region’s financial standing into account. While some observers raised the possibility for revising down the target, others called it unlikely given its potential side effect on the country’s international reliability. “Albeit voluntary, the goal was a promise to the international community. If the new government backpedals on it, it would hurt Korea’s national credibility,” a Foreign Ministry official said, requesting anonymity due to the sensitivity of the issue. The green growth initiative is deemed one of the biggest legacies of Lee, inviting praise from across the political spectrum. Since its 2008 launch, he had pushed the vision as a way to harmonize national development and environmental protection by revitalizing the economy and creating jobs through investment in clean technologies and industries. The unpopular president was credited for setting up the Global Green Growth Institute in 2010 and transforming it into the first Korea-led international organization in 2012. The feat was believed to play a role in winning the country’s bid to host the secretariat of the Green Climate Fund. But critics have said the initiative became overly politicized and lacked substance. The government has doled out hefty subsidies for various pilot programs for renewable energies and other green technologies but failed to develop them to a commercial level and create markets. Then the four-river renovation project, which was the centerpiece of the campaign, came under fire for its potential environmental harm and alleged collusion and corruption scandals involving constructors. The new government’s move to downsize organizations related to green growth was part of its plans to streamline its operations and remove any ambiguity and redundancy, officials say. But they apparently reflect its efforts to dilute Lee’s vision of green growth. Now most of the presidential commission’s most staff has returned to their agencies with their seats left unfilled. A similar organization is expected to be set up under the Prime Minister’s Office but its size, role and sway will inevitably be reduced, observers say. Shin Boo-nam, ambassador for green growth, is awaiting the Foreign Ministry’s upcoming personnel reshuffling as his current job will no longer exist. “Many positions remain vacant as people have already gone back to the agencies they initially belonged to,” an official at the commission said, requesting anonymity as he is not authorized to speak to the media. Throughout the campaign period, Park was seen as distancing herself from her successor and once intra-party archrival, a strategy that proved successful. In another irony, she herself trumpeted green growth during her visit to Lisbon in May 2011 as Lee’s special envoy. She called for cooperation in renewable energy and other green technologies during her meetings with Portuguese President Cavaco Silva and then-Foreign Minister Luis Amado. Though acknowledging the need for a review, experts and other observers call on her government to improve drawbacks and carry on the initiative’s intent. In the commission’s January poll on 1,000 adult Koreans, more than 97 percent of the respondents said the green growth policy should be sustained under the new government, while about 84 percent said the initiative has contributed to addressing climate change and tackling energy crises. Nearly 55 percent picked renewable energy as a policy priority for the new government, followed by public campaigns for green life with 34.5 percent, an expansion of greenhouse gas regulations with 32.8 percent and support for research and development in green technologies with 28 percent. The survey was conducted jointly by Hankook Research with a 95 percent confidence level and sampling error of 3.1 percent. During the Lee administration, “ministries pursued their own policy without the accurate understanding of green growth and thus floundered in drawing outcome,” the Korea Environment Institute said in a report released last week. The state-run think tank called on its successor to set its sights on cutting greenhouse gas emissions and adapting to climate change rather than to cover the entire environmental field. “It should overcome slogans and justifications and craft measures that can actually induce change in people’s behavior,” the report said.